"Our study further revealed an interesting finding in that the approaches used for ablation do not affect the effectiveness of the ablation treatment." The study showed that the percutaneous approach is better tolerated by the patients, with significantly less post-procedural pain. Percutaneous imaging guided radiofrequency ablation (RFA) of hepatocellular carcinoma is a safe and effective technique, with benefits such as reduced post-procedural pain and length of hospital stay, according to a study conducted by researchers from Changi General Hospital in Singapore. Radiofrequency ablation of a liver tumor may be performed in a number of ways, said Hui Seong Teh, MD, lead author of the study. 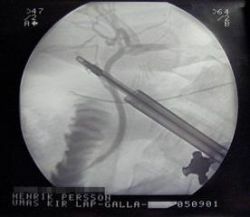 Two commonly used techniques are the percutaneous approach and open surgery. There have been few studies that compare the efficacy of the two methods, Dr. Teh says. The study showed that the percutaneous approach is better tolerated by the patients, with significantly less post-procedural pain. Based on an objective scoring system, average pain score was 0.1 for patients who underwent the percutaneous technique, compared to 1.4 for those who had ablation performed with open laprotomy. Patients also have a much shorter stay in the hospital if they were treated using the percutaneous method, Dr. Teh says. The average length of stay in hospital was 2 days for patients who had the percutaneous method, compared to 10 days for those who had open RFA. The shorter length of hospital stay allows patients to resume their activity of daily living faster and enable their early return to active economy, says Dr. Teh. "Our study further revealed an interesting finding in that the approaches used for ablation do not affect the effectiveness of the ablation treatment," Dr. Teh added. "The choice of RFA methods will affect the hospital resources spent on these patients, and will have a significant impact on healthcare cost," he said. The full results of this study will be presented on Wednesday, May 9, 2007 during the American Roentgen Ray Societyâs annual meeting in Orlando, FL.